They’re destructive, annoying and, worst of all, they bite! We’re talking about those pesky ants, of course. Apart from obvious places like your sugar and cookie jar, you can find ants in some very unlikely areas. From dirty laundry baskets and stovetops, to kitchen sinks and other unsanitary places in your home; ants (quite literally) can be found anywhere! Now, whether you’re facing an ant problem currently or just looking for preventative measures to keep these tiny pests at bay, there are some very effective (and safe) ways to get rid of ants! What’s more, these solutions involve the use of common household products that are probably right at your fingertips! 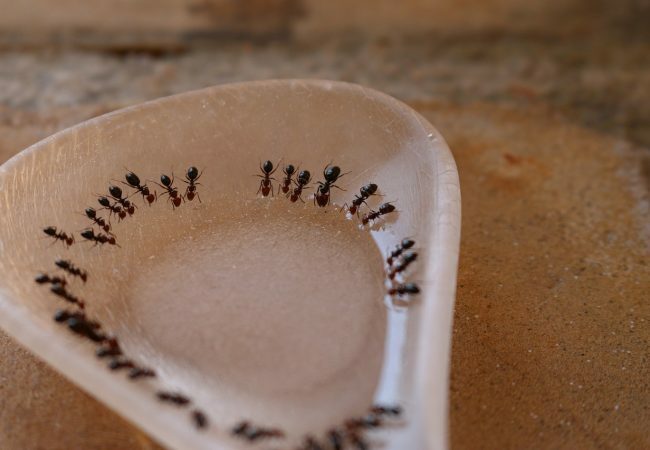 So, without any anymore time, here are 7 effective ingredients to keep ants away! While most of us love a fresh lemony scent, ants (and cockroaches) hate it! They will turn around and walk the other way as soon as they get a whiff of the lime or lemon smell. If you have a persistent ant problem, squeeze or pour the juice directly along the entry, as well as the areas where ants can be found. If it is a one-off incident, mix 2-3 tablespoons of lime or lemon juice in 1/4 cup of water and spritz the necessary areas to ward off ants. It may look a little messy but trust us, it will be temporary. Sprinkle some cayenne pepper powder around areas with a recurring ant problem. These places are generally sugar jars, food containers, etc. Since they don’t like the pungent smell (or taste) of pepper, they will stop coming around. Once that happens, clean up the powder and the ants will never know! You can also make a line of cayenne pepper powder running down the back of a dirty kitchen counter to keep ants away while you’re cooking. Vinegar is your home’s best friend! It has so many awesome household uses which includes getting rid of ants! For this, white vinegar and water mixed in equal parts is all you need. Pour this solution into a spray bottle and use it as an ant-repellent wherever needed. In case of any nearby ant holes or anthills, pour raw vinegar in and around these ant homes to eradicate them once and for all. The aroma of bay leaves in food is mouth-watering for us and a total turn-off for ants! If you have a leaf or two to spare, you can use them to keep ants away from kitchen cabinets, food containers and other areas where the smell will be contained. Simply tape the bay leaf to the inside of your cabinets and storage lids to serve as an ant repellent. If you find that the aroma from the leaf is influencing other foods in your storage jars/containers, simply tape the leaf to the top of the lid instead. Although clove oil is on the pricey side when compared to the ingredients mentioned above, even the smallest amount is highly effective is repelling ants. All you need is a few drops which can be applied onto a surface using a cotton swab. The smell of clove oil typically lasts for a good 2 weeks which is more than enough time for ants to give up on coming back. However, if you’re looking for a short-term fix or hoping to your clove oil more sparingly, simply mix a few drops of water in the oil and apply it wherever needed. The presence of calcium carbonate is one of the main reasons why chalk is strongly disliked by ants. In fact, there are several types of chalks made specially to repel ants and bugs; however, many of these are not safe for children and pets alike. Regular chalk, on the other hand, is a great way to stop ants from entering your home in a safe manner. The only downside is that it requires regular application as chalk wipes off rather easily. Nevertheless, when applied around table legs and counters, you can rest assured that there won’t be any ants climbing upward. Finally, if you aren’t worried about ants entering your house but more concerned with them sneaking into a jar of goodies, simply put tape around it, sticky-side-up! If you have double-sided tape, that would be more convenient; however, regular scotch tape will also do the trick. Their little legs will get stuck on the tape and discourage others from coming back. So from now on, don’t let ants get the better of you! Stay one step ahead of them with these safe, household remedies! NOTE: Some ant species may not be repelled by a certain ingredient; therefore, it’s advisable to give each of them a try to find out which one works best. Previous Post: Spring Cleaning Challenge – 6 Days That Will Transform Your Home!